Saks Fifth Avenue is an American department store that offers designer clothing and accessories for men, women, and children. With Big Apple Buddy’s personal shopping service, you can now buy direct from the USA Saks Fifth Avenue online store anytime, anywhere. Here, you can shop from top clothing and accessory brands, like Alexander McQueen, Diane von Furstenberg, Prada, Ralph Lauren, and many more. 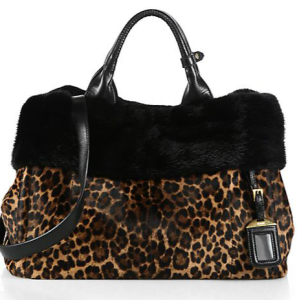 The Cavallino & Mink Fur Garden Bag is just one of the many stunning and elegant handbags you can buy online at the USA Saks Fifth Avenue store. This bag is classic in shape but bold in style, and with double top handles and a removable adjustable shoulder strap, you can carry it whichever way is most comfortable for you. This bag is large enough to hold all of your daily essentials and makes a great travel companion! If you’re looking for something to wear for a special occasion, you’ll have plenty of high fashion looks to choose from at Saks. This St. John Metallic Degrade Knit Sheath is a shimmering scoopneck dress that will certainly make any special occasion even more memorable. With a shimmering metallic navy pattern, this dress can either be worn on its own, or you could pair it with its matching jacket! Either way, you’ll be making a serious fashion statement. There are plenty of looks for men to shop from as well at Saks. 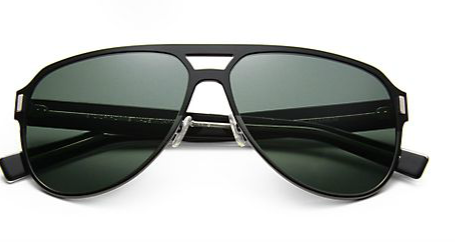 These Dior Homme Black Tie Titanium Aviator Sunglasses are the perfect accessory to protect your eyes on a sunny day. The quintessentially cool aviator look will keep you feeling stylish, and the lightweight titanium design makes them easy to slip into your pocket when you don’t need to wear them. These shades are perfect for the spring/summer and those sunny bright days in the fall and winter! Unfortunately, the USA Saks Fifth Avenue online store currently only offers international shipping for select brands. However, Big Apple Buddy, your personal shopper, can help you buy products direct from the official USA Saks Fifth Avenue online store and ship them to your doorstep, no matter where you are in the world. If you would like to buy from the USA Saks Fifth Avenue online store, simply let us know which items you would like to order (by filling out the form below) and we’ll get back to you with a free international shipping quote within 24 hours!